DIE Martis, 11 die Decembris. Winn and Bodvell to be heard against it. Taylor, who suffered Pritchard to escape, released. Serjeants at Arms Pet. for their Salary for attending this House. The King to be moved to increase the Salary of the Warden of the Mint. Epus. Rochester. Ds. Custos Privati Sigilli. Hodie 2a vice lecta est Billa, "An Act for settling the Estate of John Bodvell Esquire, deceased." Also a Petition of Griffith Winn and Thomas Bodvell, desiring to be heard before the passing of the said Bill, was read. "Upon the Second Reading of a Bill, intituled, An Act for settling the Estate of John Bodvell Esquire, deceased; as also the reading of the humble Petition of Griffith Wynnc, alias Bodvell, and Thomas Bodvell, Infants, concerning the Matters mentioned in the said Bill: It is ORDERED, by the Lords Spiritual and Temporal in Parliament assembled, That the Counsel and Witnesses on both Parts shall be heard, at the Bar of this House, on Thursday the Thirteenth Day of this Instant December, concerning the Contents of the said Bill; whereof as well the Prosecutors of the said Bill, as the Petitioners and Thomas Wynne Esquire, are hereby to take Notice." Hodie 3a vice lecta est Billa, "An Act for encouraging of Coinage." The Question being put, "Whether this Bill now read, with the Amendments, Additions, and provisos, shall pass?" To return the Bill, intituled, "An Act for encouraging of Coinage;" which the Lords have passed, with some Amendments, Additions, and Provisos, to which the Lords desire their Concurrence. The Earl of Bridgwater reported, "That the Committee have considered the Bill to enable Leycester Grosevenor to sell Lands, for Payment of Debts; and are of Opinion it is fit to pass, with some Amendments;" which being read Twice, and Agreed unto, the Bill is ordered to be engrossed, with the said Amendments. ORDERED, That the Committee appointed for the Bill for uniting of Churches in the Town of South'ton, do meet on Saturday next, in the Afternoon; and the Lord Chandos and the Lord Bishop of Rochester are added to the said Committee. 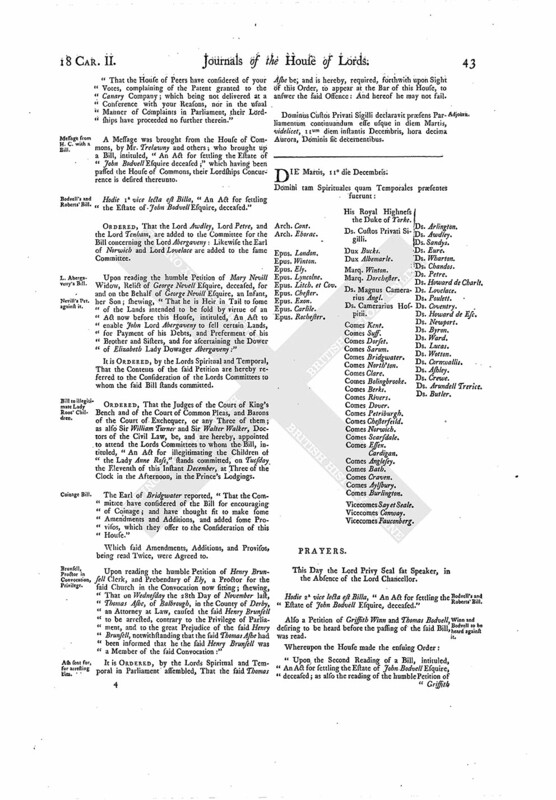 ORDERED, That the Committee appointed by this House to prepare a Bill, to be offered to this House, for regulating the Rates and Prices of Victuals and other Commodities, shall fit To-morrow in the Afternoon, at Three of the Clock, in the Prince's Lodgings; at which Time, and at such other Times as their Lordships shall think fit to adjourn the said Committee, Mr. Justice Tyrrell and Mr. Baron Turner are hereby appointed to attend them. It is ORDERED, by the Lords Spiritual and Temporal in Parliament assembled, That the said Thomas Taylor be, and is hereby, discharged from his present Restraint for the same, paying his Fees: And this shall be a sufficient Warrant on that Behalf. 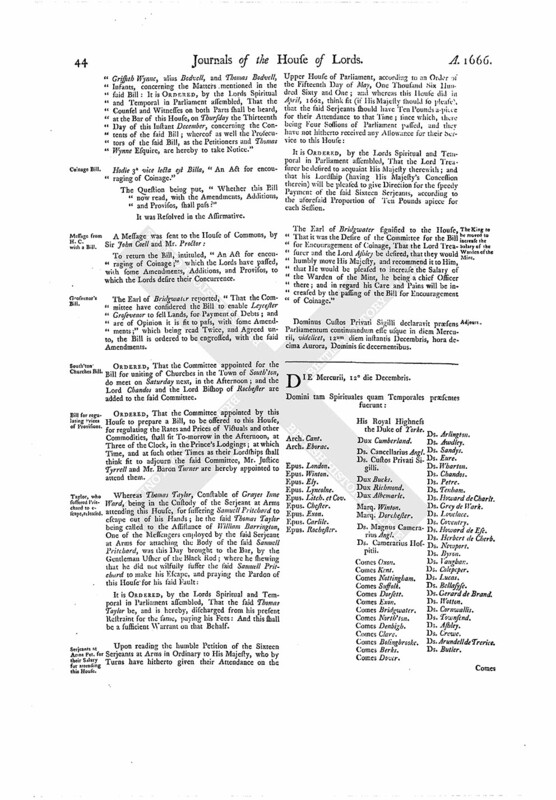 It is ORDERED, by the Lords Spiritual and Temporal in Parliament assembled, That the Lord Treasurer be desired to acquaint His Majesty therewith; and that his Lordship (having His Majesty's Concession therein) will be pleased to give Direction for the speedy Payment of the said Sixteen Serjeants, according to the aforesaid Proportion of Ten Pounds apiece for each Session. The Earl of Bridgewater signified to the House, "That it was the Desire of the Committee for the Bill for Encouragement of Coinage, That the Lord Treasurer and the Lord Ashley be desired, that they would humbly move His Majesty, and recommend it to Him, that He would be pleased to increase the Salary of the Warden of the Mint, he being a chief Officer there; and in regard his Care and Pains will be increased by the passing of the Bill for Encouragement of Coinage." Dominus Custos Privati Sigilli declaravit præsens Parliamentum continuandum esse usque in diem Mercurii, videlicet, 12um diem instantis Decembris, hora decima Aurora, Dominis sic decernentibus.